Robert Quinn (born May 18, 1990) is an American football defensive end for the Los Angeles Rams of the National Football League (NFL). He played college football at North Carolina, and was drafted by the Rams in the first round of the 2011 NFL Draft. Quinn attended Fort Dorchester High School in North Charleston, South Carolina, where he played for the Fort Dorchester Patriots high school football team. As a senior his season was shortened after undergoing brain surgery for a benign tumor. Quinn made a full recovery and was able to resume his football career. He registered 54 tackles, 10 tackles for loss, 5 sacks and 21 quarterback hurries before the surgery. He was ranked the 19th best defensive end recruit by Scout.com and the 18th by Rivals.com He was also a 3-time heavyweight state champ in 4A wrestling. He also played in the 2008 U.S. Army All-American Bowl. As a sophomore in 2009 Quinn had 52 tackles and led the ACC and was 15th in the country in tackles for losses with 19.0 and was second in the league and 16th in the nation in sacks with 11.0 sacks. Additionally, he had three pass breakups and was second in the ACC and fourth in the country with six forced fumbles. For his efforts he was a First-team All-ACC selection and was a Second-team All-American by CBS. He also finished second in the ACC Defensive Player of the Year voting. Already in April 2010, Quinn was regarded as one of the top prospects for the 2011 NFL Draft. Despite sitting out all of his junior season, he was still projected to be a top-10 selection in January 2011. His stock slightly dropped after the combine, projecting him at No. 11 in early March. Quinn was eventually drafted as the 14th pick in the 2011 NFL Draft by the St. Louis Rams. On July 30, 2011 Quinn signed a four-year $9.4 million contract (including a $5.3 million signing bonus) with the St. Louis Rams and arrived a day late to practice due to the birth of his first son. On September 19, 2011, Quinn recorded his first career sack against the Giants on Monday Night Football. On October 30, 2011, Quinn recorded his second sack and blocked a punt against the New Orleans Saints, earning the NFC Special Teams Player of the Week Award for his effort. Quinn ended his rookie season with five sacks, three blocked punts, and generated positive reviews for his pass rushing skills. In 2012, Quinn started fourteen of the Rams' sixteen games. He set career highs in tackles and sacks with 29 and 10.5, respectively. In Week 5 against the Arizona Cardinals, Quinn recorded 3 sacks, a pass deflect, and the first forced fumble of his career. In Week 1 of 2013 versus the Arizona Cardinals, Quinn tied his career high for sacks in a game with three, causing two fumbles and was also held once by Cardinal left tackle Levi Brown in a 27–24 Rams win in St. Louis. For his efforts he was named Sports Illustrated's NFC Defensive Player of the Week for the first time. In addition he was named the Official NFL NFC Defensive Player of the Week on September 11, 2013. In Week 11 Quinn forced a fumble that was recovered for a touchdown by Chris Long and for their efforts they were named co-Sports Illustrated's NFC Defensive Players of the Week. In week 16, Quinn recorded 3 sacks against the Tampa Bay Buccaneers, passing Kevin Carter for the most sacks in a single season by a Ram with 18. 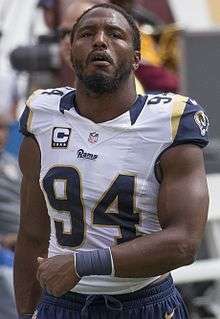 Robert Quinn was awarded the 2013 PFWA Defensive Player of the Year award; in addition to being a consensus First-team All-Pro. On September 13, 2014 Quinn signed a six-year extension with the Rams through 2019. Quinn is the brother of Puerto Rican hurdler Jasmine Quinn. ↑ "UNC severs ties with Austin, Little, Quinn". The News & Observer. November 19, 2013. Archived from the original on December 18, 2013. ↑ Lande, Russ (April 26, 2010). "Never too early: A first look at the first round of the 2011 NFL draft". Sporting News. ↑ Perloff, Andrew (April 27, 2010). "(Way early) 2011 NFL Mock Draft". SI.com. ↑ Banks, Don (January 27, 2011). "2011 NFL Mock Draft 1.0". SI.com. ↑ Banks, Don (March 9, 2011). "2011 NFL Mock Draft 3.0". SI.com. ↑ "Robert Quinn". NFL Draft scout.com. February 28, 2011. Retrieved April 27, 2011. ↑ "Robert Quinn". ESPN NFL Draft tracker.com. April 27, 2011. Retrieved April 27, 2011. ↑ Lyons, Joe. "Rams boot Tampa Bay 23–13". Quinn lead the NFC with 19 sacks in 2013. He also made his first Pro Bowl appearance this season. ↑ Patra, Kevin (September 13, 2014). "Rams sign DE Robert Quinn to four-year extension". NFL.com. Retrieved September 13, 2014. ↑ "Robert Quinn Stats". ESPN. ESPN Internet Ventures. Retrieved 29 April 2015. ↑ "Jasmine Camacho-Quinn contará con el apoyo de su hermano". Primera Hora (in Spanish). Retrieved August 18, 2016.